Thanks to everyone for all the great questions. 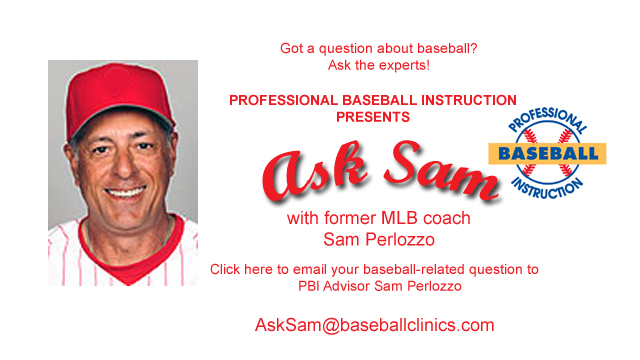 Send your questions to me via email – AskSam@baseballclinics.com. Runners on second and third, no outs, pitcher is in the full, a bunt play is on. Where do you bunt the ball? I’m not sure you’d want to bunt the ball in that situation. There’s no conventional double play possibility, and you can score on pretty much anything put into play in the outfield. When you make contact with ball and it’s right down the middle should your back shoulder be dipped below your front shoulder? Dropping your back shoulder isn’t a good idea; it’s not going to permit you to properly “square up” the ball. No, the batter is not out unless the fielder gets the ball and touches first before the batter gets there. We’ll submit your question to Sam for an upcoming “Ask Sam” entry. If a runner steals a base. If he’s on the base when the pitch is throw and the batter fouls it off does he go back to the original bag or does he stay at the stolen base if he was already there before the pitch was thrown? What if national league road team leads off with a bench hitter, than puts pitcher in 1st batting spot?